OK Slip Falls is among the highest waterfalls in New York State. 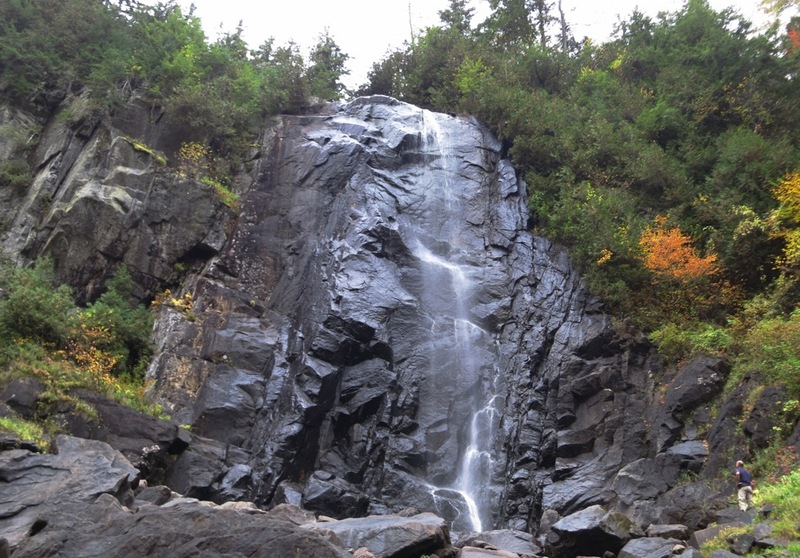 Located in the Adirondacks north of Route 28, halfway between North River and Indian Lake, the falls cascade nearly 250 feet in one spot on its path from OK Slip Pond to the Hudson River. 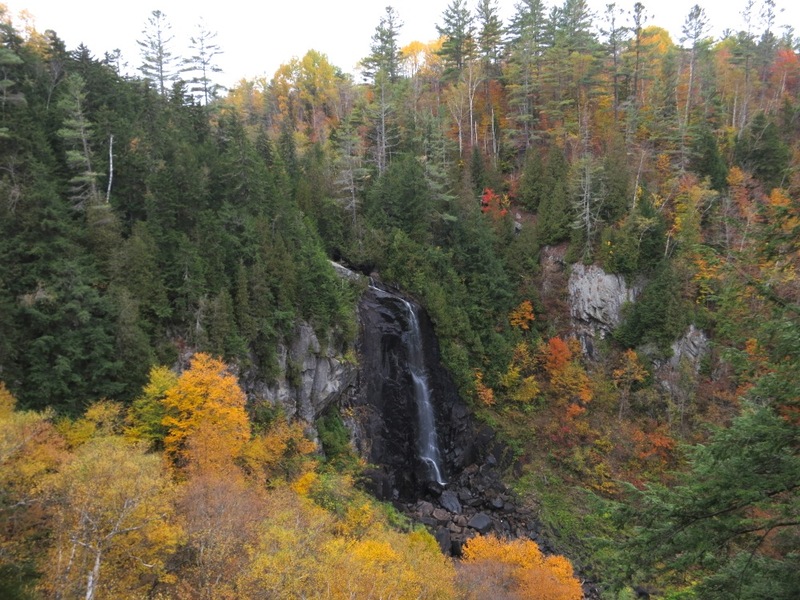 I’ve imagined OK Slip Falls ever since the late 70s when I first read about the remote and inaccessible wonder. For as long as I can remember, OK Slip Brook has been on land owned by the Finch Pryn paper company. But in 2009, the OK Slip Tract was acquired by Nature Conservancy and in the past year the lands were sold to the state in a blockbuster land deal that included diverse parcels throughout the central and southwestern Adirondacks. Over the last few months access to the tract had been officially “discouraged” but as far as I could tell, it was not prohibited. 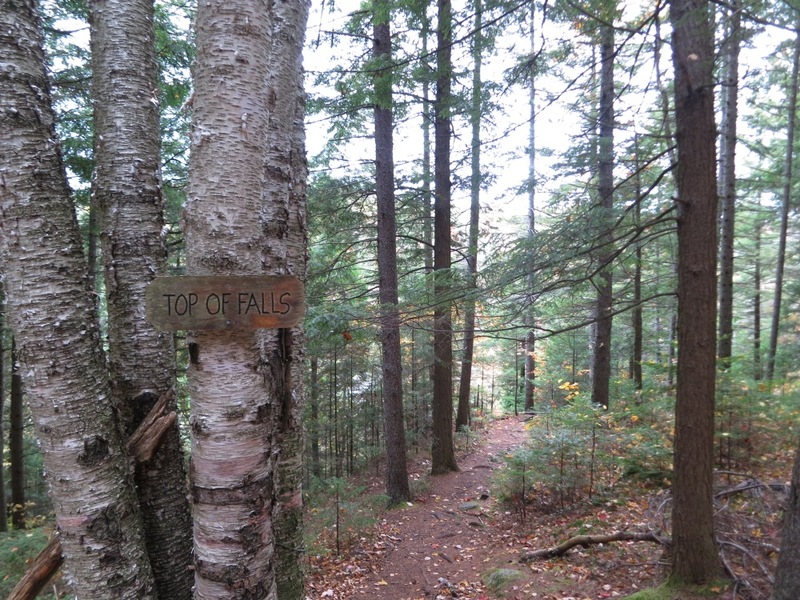 More recently, the DEC took a softer approach, “recommending” that hikers wait for the construction of an official trail. Conventional wisdom suggests trekking to the cataract when the rivers are running high, not after a September without much rain. But the mere fact that OK Slip Falls was open for business, was enough to motivate me to make a powder style drive to the goods. Indeed the cascade was just a dribble. Regardless, the spot is spectacular from multiple angles. One advantage of low water was that we walked right into the landing zone for the big spring runoff. It’s seems from the way the rocks are worn that water lands well away from the bottom of the cliff when it is really flowing. The entire area surrounding the OK Slip Brook gorge is spectacular. 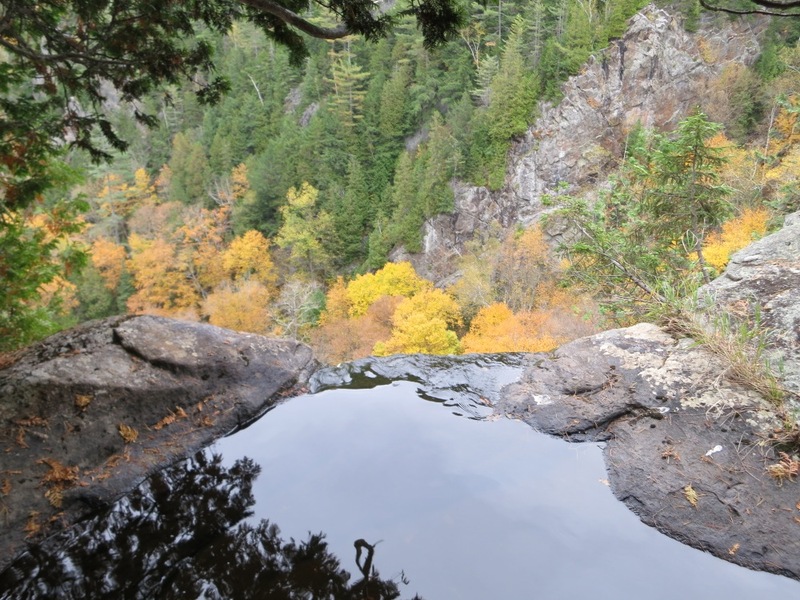 Even on a gray, past-peak foliage day, the view from the top of the falls was heart-stopping. I know that the state’s relentless drive to acquire land is controversial. And, that this spot will inevitably become less wild as visitor volume rises. And that there is a lot of work to be done, setting up a trailhead, marking trails and guiding the visitor flow. In my opinion, the state should own this treasure, and really do what it takes to own it. But then it’s so hard for me to be objective. I’ve wanted to see OK Slip Falls NY since I was a kid. Great post, and it’s nice to see some new pictures! I was reading again this weekend about the falls, but it seems the state is no closer to a decision. Would love to chat someone and figure an optimal access route in the absence of an established public trail. During the 80s a friends father belonged to a camp with access to the falls, made the trip out. Would like to get back out there. 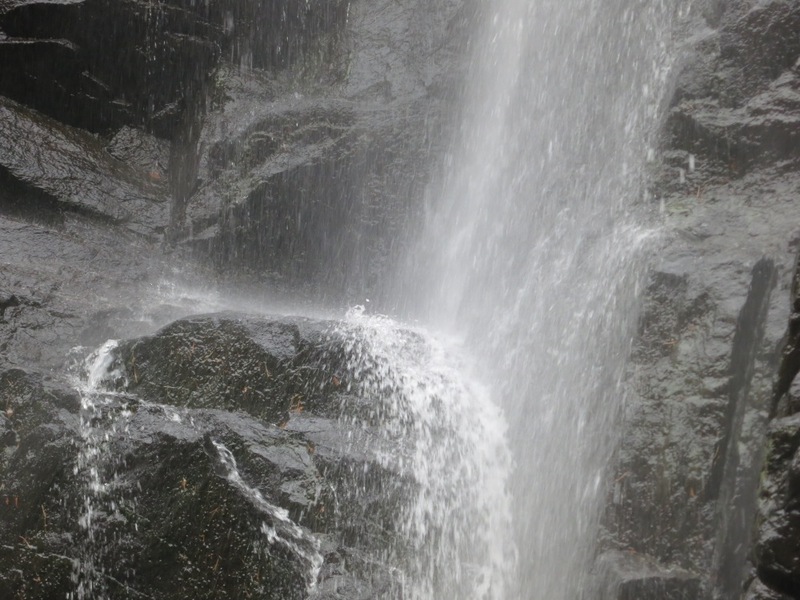 OK Slip falls is VERY accessible from Northern Frontier Camp. My son and I stayed there last summer for a few days on a retreat. The Falls were an awesome sight! Nice work, Harvey. It’s hard to imagine standing on a wild spot like that alone. You’re really bringing the goods back in all seasons these days! Was the water on the river terribly refreshing? Great post on a great hike. Thanks for asking me to go along with you. I will put it on my list to do again and again! Nice. I gotta spend more time in the southern ADKs. I went in 10/3. It was all that was promised and much more. Did not get under the falls but will next trip. It does appear to be a fragile area and steep drop offs will no doubt present a hazard some will not heed. A beautiful spot! There is certainly a lot of confusion regarding access. We were granted permission to walk in, but I’m not positive we needed it. I strongly recommend staying away from the Northern Frontier camp. It’s private property and crossing NF land could put access in jeopardy. @ml242: I never got wet, so I don’t know if the river was cold! @Cloudsplitter: I totally agree that even with water levels low it’s spectacular and also very fragile. The DEC has really got to get their act together quickly. Duck you, my man, are a great hiking partner. What an adventure! Beautiful! We’re going in search of the falls tomorrow. Can you provide any sense of the distance or difficulty. Bringing kids, and hoping its not too difficult for my little one. Ellen, how little is little? When we could carry our daughter it was all good. The route we took was probably 4 miles each way. Assuming you are coming in from Route 28: The first half is simple to follow and easy to walk as it is a road. There may have been more foot traffic since then making the path easier to follow but I would not call it well marked. Also I would not recommend going beyond the original view spot shown in the second picture. Going to the bottom of the falls or even the top, IMO is dangerous for kids.